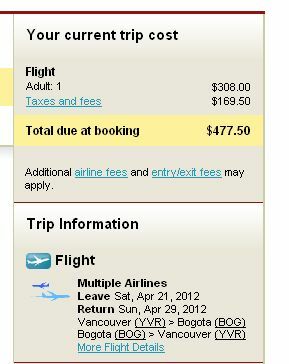 So I found a flight to Bogota, Colombia (BOG) for $477.50 roundtrip after taxes that leaves in April of 2012. Over 55% cheaper than the cheapest flights to Colombia usually cost, and probably the cheapest flight to South America I've ever seen from Vancouver. When you hear 'Colombia' it's hard not to think of the stereotypes: drugs, kidnappings, crime. But when you actually do the research, the dangers seem to be more cliché than reality. The more I travel, the more I find that the reputations of 'dangerous' places have been greatly exaggerated, usually from people that have never actually stepped foot inside the country. For anyone else out there that wouldn't be afraid to visit Colombia, here's how I found it. 1. Do a search from Vancouver to Bogota, Colombia (BOG) from April 21 to 29 on Kayak. 2. Click on the price and select CheapTickets.com (owned by Orbitz). The price may initially show higher, but when you get to CheapTickets.com, the price drops to $477 roundtrip after taxes. For a 2 week trip, try Apr 28 - May 13 it looks to be another cheap date combo. Hit Like if you would not be afraid to visit Colombia! Click Share to show your friends on Facebook. vancouver, yvr, flight deals, south america, bogota, colombia and bog. 2 Responses to "Does Colombia scare you? $477 USD roundtrip after taxes"